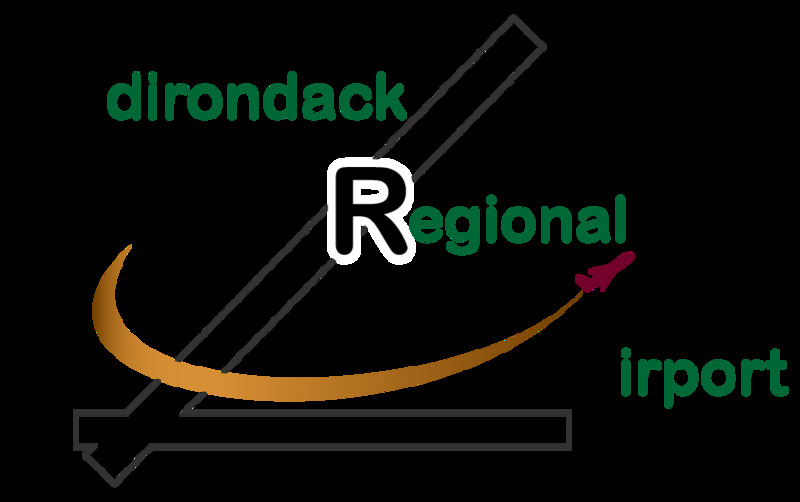 HARRIETSTOWN — A new website for Adirondack Regional Airport aims to make air travel in and out of the region easier. For many years, the local airport had one page of information via Town of Harrietstown and Village of Saranac Lake websites. Now, an independent presence online provides details for public and private flight information and for aircraft pilots, as well. Airport Manager Corey Hurwitch coordinated the new website and its recent launch. “We’ve been working on it for a while,” he said on Wednesday. “ROOST (Regional Office of Sustainable Tourism) actually helped us out with it. "We purchased the domain name for $14, but that was the only cost to us,” Hurwitch said. In addition to detailed flight and weather updates, adirondackairport.com has a section for news information. “We are going to try and do news updates, but with limited staff, it is sometimes tough to keep up,” Hurwitch said. The site also carries information on the nearby communities of Saranac Lake, Lake Placid and Tupper Lake. Currently, the airport is working on improvements to an onsite hangar. “We have a project out to bid for expanding our snow-removal and rescue equipment building. But we are still awaiting approval for funding. "We have applied to the FAA for a grant for that,” Hurwitch said of ongoing renovations at the local air hub. The website will also help direct local travelers to Cape Air and commercial flights. “We ran it by Cape Air for feedback on their portion,” Hurwitch said. But the website will likely prove helpful, as people can check for updates on Cape Air’s flight schedule, which does change by the season. “This new online presence should help to enhance the promotion of the airport to both private pilots and charter flights,” Hurwitch said. The Senate has drawn the attention of the U.S. Department of Transportation to federal regulations they believe United/Cape Air has violated during a “heavy maintenance period” between 2014 and 2015 that saw hundreds of passengers flying to and from Guam affected by a series of cancelled and delayed flights. Sens. Arnold Palacios (R-Saipan) and Sixto Igisomar (R-Saipan) point federal officials to the regulations of “on time performance,” “flight service notification,” and “unrealistic scheduling regulations” that they believe the airlines has violated, in a letter to the transportation department on Feb. 17. “In our opinion, Cape Air violated all three applicable regulations,” the senators said. On “on time performance,” the senators said Cape Air flight delays ranged from three to 10 hours, with cancellations lasting from one to several days. The delays and cancellations occurred weekly and sometimes a couple times a week or daily during Cape Air’s heavy maintenance period, they add. Palacios and Igisomar acknowledge that while the delay or cancellations may not have occurred more than half of the time of its flights, every delay caused “economic hardship” and “personal suffering” on passengers. “If Cape Air’s connecting flight from Saipan to Hawaii is cancelled, the person cannot leave until the next day,” the senators said. “That means the person will miss his meeting or be late his meeting or whatever planned occasion for which he was traveling. The senators also lament the irregular and sporadic flight status notifications during Cape Air’s heavy maintenance period, and write that sometimes passengers receive an email or a phone call on delays or cancellations but sometimes, not at all until the passenger reaches the airport. They write that passengers are even allowed to check in at the airport when a flight is delayed up to six hours or more, before they are told the flight is cancelled due to mechanical problems. “Passengers spend countless hours waiting,” the senators write. The senators write that the nine-month period was a very long time to be flying one plane, and that mechanical and other problems would be expected with one plane flying five times a day. 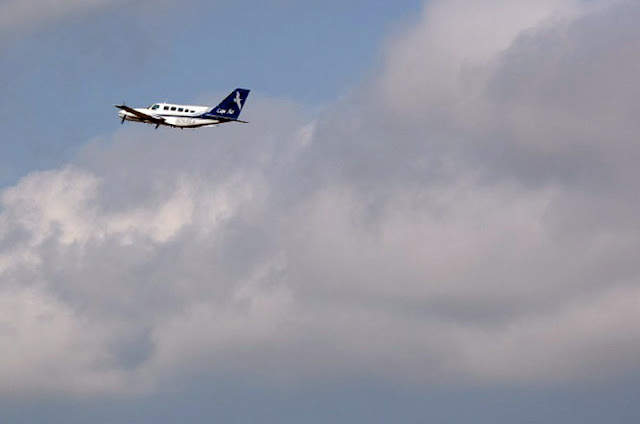 “The problem was that Cape Air did not have an alternative flight plan for its one aircraft,” Palacios and Igisomar said. “Cape Air failed to reduce its flights when the mechanical problems started. “It maintained the same flight schedule knowing that it would be difficult if not impossible to maintain,” they add. “Even when the delays and cancellations were back to back each week, Cape Air failed to change its flight schedule. The senators further lament that United Airlines, code-share partners with Cape Air, would only step in to assist passengers when all five daily Cape Air flights were cancelled or when several flights were cancelled for two days or more. The senators argue that Cape Air should have scheduled only three flights or less per day instead of attempting five flights a day with one plane. United also should have flown a jet plane to Saipan at least once a week to alleviate the backlog of passengers, they add. “Instead, Cape Air ‘unrealistically’ continued with its scheduled flights from which it could not reasonably make due,” the senators said. The senators closed the letter by saying they look forward to receiving information on filing a consumer complaint against the United Airlines and Cape Air, and said they will continue to compile passenger complaints the senators have received since 2014 over the unreliable and poor service during the airlines’ heavy maintenance period. 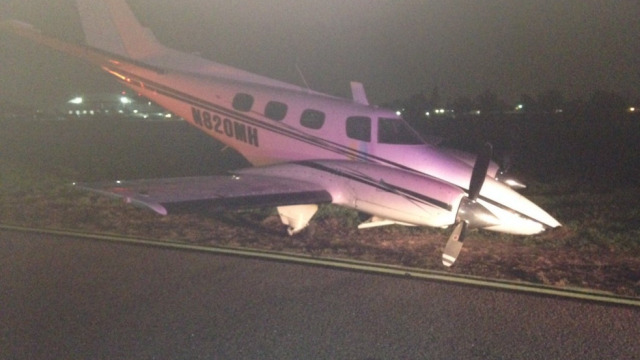 VAN NUYS (CBSLA.com) — A small airplane landed safely at Van Nuys airport on Saturday night without the use of its frontmost landing gear. The Los Angeles Airport Police Department said that at about 11 p.m., the Beechcraft 60 Duke touched down at the airport without the use of its “nose gear,” or the landing gear that is deployed from underneath the nose of the plane. Photos show the aircraft tilting forward on grass next to the runway. 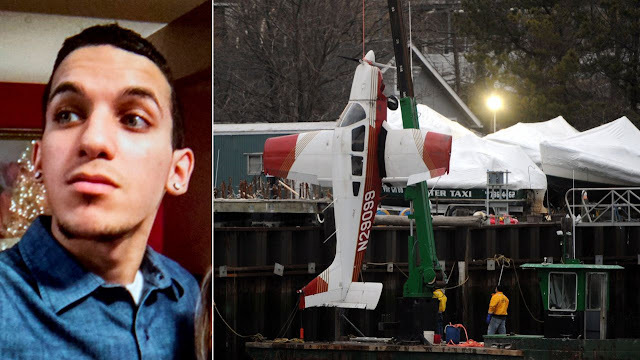 PORT JEFFERSON, Long Island (WABC) -- Recovery efforts resume Monday morning as police look for a Queens man missing after a small plane went down in Long Island Sound Saturday night with four people on board. 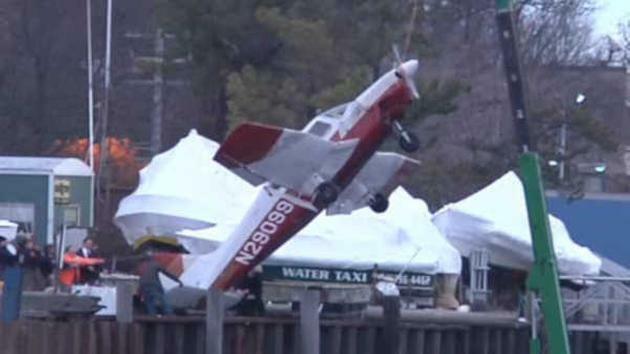 The single-engine aircraft was raised from Setauket Inlet Sunday. 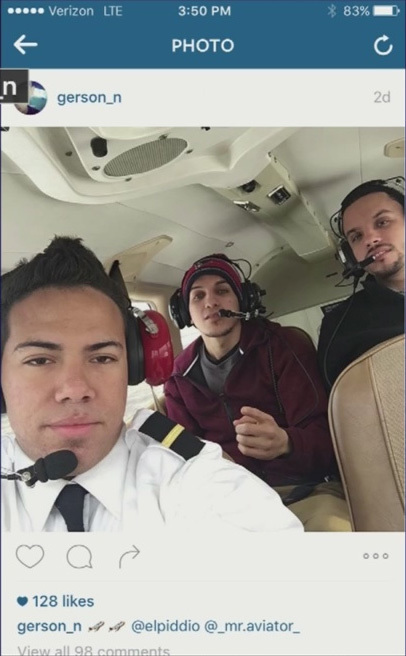 The Coast Guard called off the search for 23-year-old Gerson Salmon-Negron Sunday. Authorities say the Piper PA-28 small plane went down around 11:35 p.m., landing in Setauket Harbor. The plane was pulled out of the water Sunday night. Suffolk County police say two people were rescued after the crash and a third person also has been accounted for. At 11:00 Saturday night, the four-seater plane from Massachusetts made an emergency landing after the engine lost power in the waters off Setauket. Eyewitness News is told there were four men on board. Emergency crews raced to the scene but their only guiding light was from the helicopter above. Suffolk County Police officers on the scene heard cries for help from the water. They didn't have time to ask for permission. They grabbed what kayaks they found from neighbors' homes, and rowed out to the exhausted and freezing victims. "Officers arrived to the scene, made their way down to the shoreline, commandeered kayaks from local residents and went into the water to rescue these victims," said Suffolk County Police Commissioner Timothy Sini. A student pilot, Austricio Ramirez, was flying at the time the plane began experiencing difficulties and turned the controls over to the instructor pilot, Nelson Gomez, according to police. 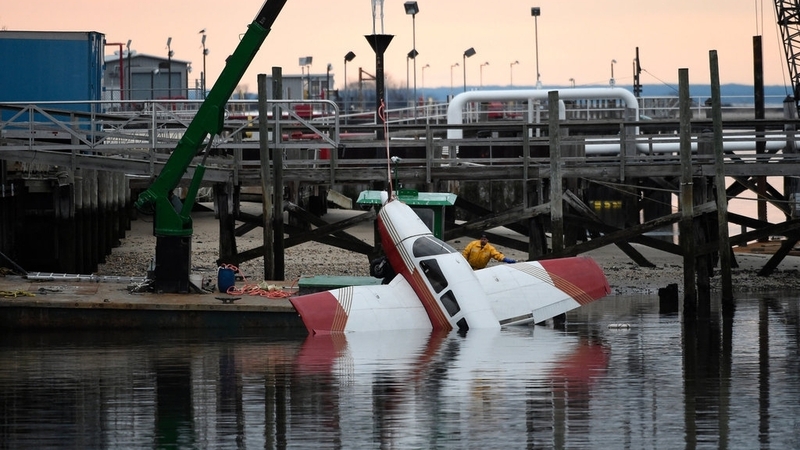 Gomez landed the plane in Setauket Harbor and all four occupants were able to exit the plane into the water. Three men, Ramirez, Gomez, and Wady Perez, were rescued by Suffolk County Police officers. The fourth, Salmon-Negron, remains missing. Arlene Salac, a spokeswoman for the Federal Aviation Administration, said early Sunday that the pilot reported engine trouble and made the "forced landing." She said the FAA is investigating and the National Transportation Safety Board will determine the probable cause. Ramirez, 25, from the Bronx, Gomez, 36, from Queens, and Perez, 25, from Queens, were all transported to Stony Brook University Hospital where they were treated and released. Suffolk County Police called off their search at 7 p.m. Sunday, but will resume at 9 a.m. Monday. This is now being called a 'recovery effort', and not a rescue. 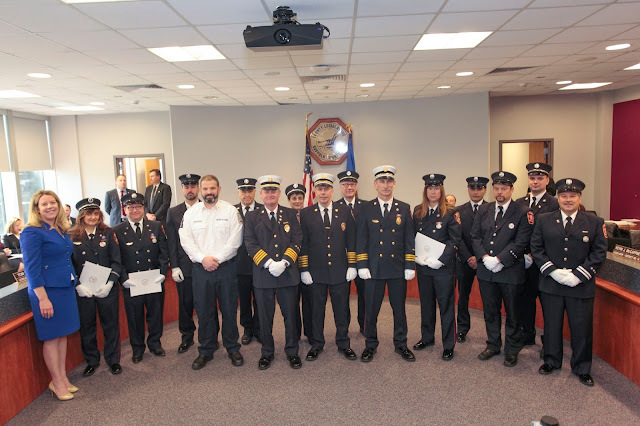 Setauket, NY - March 3rd, 2016 - The Suffolk Legislature this week recognized heroic actions taken by seven members of the County’s Police Department and the 20 agencies that responded to a small plane crash in Setauket late last month. It was just after 11:00 p.m. on Saturday, February 20, 2016 when police received notification that a small, private plane with 4 passengers aboard experienced engine trouble and was forced to make an emergency water landing onto and into Setauket Harbor. Upon arrival to a chaotic crash scene, first responders began efforts to rescue survivors from the dark and frigid waters, putting their own safety in peril in order to save those scattered throughout the harbor and in danger of succumbing to hypothermia. The decisive and valiant efforts of responders that night ensured the safe rescue of three of the four passengers. 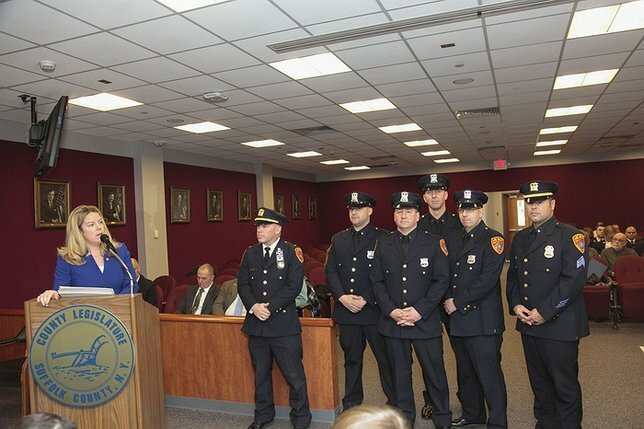 Suffolk County Police Department Lieutenant Michael S. Murphy, Sergeant Paul Mercready, Officer Christopher Draskin, Officer Vashawn Hussain, Officer Matthew Merced, Officer John Roy and Officer Charles Scala are credited with commandeering available resources and rushing toward danger to remove victims from the icy waters. The Suffolk County Police Department continues its search for the one passenger not rescued that night. However, because of the actions of the men and women recognized this week, that number is one and not four. A U.S. security decision that banned private Canadian aircraft from flying through American airspace when travelling between cities in Canada affected dozens of flights and cost thousands of dollars in extra fuel before the decision was reversed, industry officials say. The U.S. Federal Aviation Administration [FAA] issued a notice Dec.14 last year warning private pilots that all foreign private planes now had to obtain diplomatic clearance from the secretary of state before entering U.S. airspace. The situation persisted for a month and cost thousands of dollars in increased fuel as planes had to be diverted. Bernard Gervais president of the Canadian Owners and Pilots Association [COPA] worries the situation could reoccur. "I don't want this to happen again," Gervais told CBC News. "It's a big issue for us. We need overfly there. There's no wall between our countries. It's always been that way." Rudy Toering, president of the Canadian Business Aviation Association, says he wants reassurance from Transport Canada and the FAA that both agencies will follow the proper protocol in the future. We want to know "that there will be direct communications between Canada and the United States as far as what are the impacts of this particular [decision]," Toering said. "We're taking steps both from COPA and from ourselves to make sure the proper communication protocol is in place. I'm sure on the U.S. side the same thing is happening," he added. The issue began when the FAA issued a notice to airmen (NOTAM) Dec.14, 2015 warning non commercial pilots about increased security measures. "The FAA administrator hereby orders that all U.S. territorial airspace is national defence airspace," read the notice. "Pilots of such aircraft that do not adhere to procedures in the special security requirements contained in the NOTAM may be intercepted, detained and interviewed by law enforcement, U.S. Secret Service, or other security personnel. "Any person who knowingly or willfully violates the special security requirements ... may be subject to penalties," the notice said. Both aviation groups contacted Transport Canada to discover officials in the department had no idea the notice had been issued by the U.S. authorities. "How come nobody knows about this," Toering asked. "How come Transport wasn't advised? How come our embassies weren't advised? The ban meant hundreds of private business flights within Canada that passed through U.S. airspace to save time had to be rerouted to northern flight paths. Some flight schools near the border also had to cancel lessons. The ban lasted until Jan.16 as government officials and aviation groups on both sides of the border worked together to fix the problem. Many pilots were in disbelief, said Gervais whose association represents 17,000 private pilots in Canada. "We're not at war with the U.S.," he said. "We don't have a defence zones around our countries. Why suddenly [was] this big wall between us and the U.S.?" Toering, whose association represents hundreds of companies and organizations including Walmart, Sobeys said it cost one company almost $30,000 to divert three business flights around U.S. airspace. "Every single city was affected," Toering said. "Our executives and their employees are usually going to very sensitive meetings … for us it was a monetary cost — fuel, a resource cost, and an inconvenience cost that created quite a bit of disturbance for us." To help fix the problem, the International Council of Aircraft Owner and Pilot Associations spoke to the FAA directly. "The FAA and the agencies were trying to close a perceived loophole to ensure they knew everyone that was flying over the United States," said Craig Spence, secretary general of the council. "There's a lot of repercussions that can happen if we all don't work together and they don't fully understand the impact of the decisions and some of the changes they're making," Spence added. In a statement, Transport Canada said it was contacted by pilots raising concerns and realized the notice could also affect private air ambulances and emergency evacuation aircraft. "Transport Canada, along with Canadian industry partners, engaged U.S. government officials to review the impact of the NOTAM," wrote a Transport Canada spokesperson. "The U.S. recognized the concerns and agreed to revise as quickly as they could." In a written response, an FAA spokesperson said it issued the NOTAM originally to comply with new international civil aviation organization guidance. "To streamline international operations such as provisions that made it easier for aircraft, including Canadian flights … to operate within the U.S. It also provided other needed updates," the FAA said. A Navy plane blew a tire as it made an emergency landing in St. Augustine after mechanical issues Saturday. 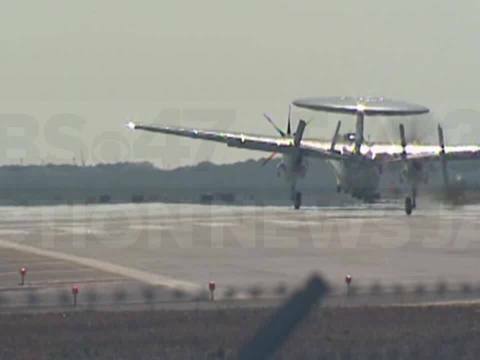 The E2-D Advanced Hawkeye aircraft dumped fuel for approximately 20 minutes before making the emergency landing at the Northeast Florida Regional Airport. Officials said the multimillion-dollar aircraft blew a tire as it landed. A witness said it sounded like the plane had lost an engine. The runway sustained minor damage after the landing, according to officials. It was closed for about an hour as crews worked to move the plane. The plane weighs approximately 40,000 pounds according to the Navy website. It will be taken to the Northrup Grumman St. Augustine facility where it was built, according to officials. The plane has state-of-the-art radar and provides advanced early warning of attacks. How has Virgin Galactic made their new spaceship safer? Virgin Galactic will soon be back in the sky and, eventually, space. On Friday, Richard Branson, the billionaire owner of Virgin Galactic, unveiled the company’s newest spacecraft, named Virgin Space Ship Unity. The spacecraft will allow Virgin Galactic to continue its pursuit of space tourism almost 16 months after its first craft was destroyed in a flight-test accident. The launch event featured Branson in a white SUV towing the brand new spacecraft, a christening by Branson’s one-year-old grandson, and celebrity appearances. The space tourism company got a boost in publicity from a recorded message from theoretical physicist Stephen Hawking, who said he planned on getting on board the craft. “If I am able to go – and if Richard will still take me, I would be very proud to fly on this spaceship,” Mr. Hawking said in his message. Despite the hype and the $250,000 price tag for a seat, the last lingering question for potential patrons could be: Is it safe? Virgin Galactic’s original SpaceShipTwo, which shared the same design as the new Space Ship Unity, experienced a catastrophic crash in October of 2014, killing one of the pilots and severely injuring the other. For a short time after the crash, many speculated whether it would be the end of Virgin Galactic’s space tourism aspirations, but the company recommitted after learning the crash was caused by piloting error. A side-by-side comparison of the Virgin Space Ship Unity and the destroyed vehicle show little difference. The two are nearly identical with the same model and manufacturing of Unity began in 2012, before the accident or any redesigns occurred. However, the Unity does feature small safety additions. A crucial pin has been added to prevent a pilot from accidentally unlocking the feathering mechanism on the ship’s tail, which caused the first crash, Mr. Whitesides told Reuters. The aircraft is designed to take passengers to the outer edge of Earth's atmosphere, some 60 miles up, then gradually descend, slowed by the feather system – which creates aerodynamic drag as the craft returns to the ground. The latest design reportedly features some improvements to make the landing gear more distinct have also been added. Are those small changes enough? Yes, for enthusiasts. Maybe, for the Federal Aviation Administration. The 2014 crash was caused by a piloting error, but the National Transportation Safety Board (NTSB) also placed blame on Scaled Composites, who built the aircraft and employed the pilots, and cited the FAA for lax regulations, according to The Los Angeles Times. The FAA’s current guidelines for spaceflight regulations have been focused on not hampering innovation with restrictions. The result is regulations around the safety of the environment, national security, and people on the ground, but a large amount of freedom for the company testing in the air. It’s unclear how, but the FAA could change their regulations following the previous Virgin Galactic crash and the recommendations of the NTSB. However, safety concerns has not prompted hesitation or slowed ticket sales for enthusiasts. The Christian Science Monitor previously reported almost 700 people have signed up for rides at a price of $250,000 each. “Together, we can make space accessible in a way that has only been dreamt of before now, and by doing so can bring positive change to life on Earth,” Branson said in the press release. The Safety Board's full report is available at http://www.ntsb.gov/investigations/AccidentReports/Pages/AccidentReports.aspx. The Aerospace Accident Report number is NTSB/AAR-15/02. On October 31, 2014, at 1007:32 Pacific daylight time, the SpaceShipTwo (SS2) reusable suborbital rocket, N339SS, operated by Scaled Composites LLC (Scaled), broke up into multiple pieces during a rocket-powered test flight and impacted terrain over a 5-mile area near Koehn Dry Lake, California. The pilot received serious injuries, and the copilot received fatal injuries. SS2 was destroyed, and no one on the ground was injured as a result of the falling debris. SS2 had been released from its launch vehicle, WhiteKnightTwo (WK2), N348MS, about 13 seconds before the structural breakup. Scaled was operating SS2 under an experimental permit issued by the Federal Aviation Administration's (FAA) Office of Commercial Space Transportation (AST) according to the provisions of 14 Code of Federal Regulations (CFR) Part 437. Scaled Composites' failure to consider and protect against the possibility that a single human error could result in a catastrophic hazard to the SpaceShipTwo vehicle. This failure set the stage for the copilot's premature unlocking of the feather system as a result of time pressure and vibration and loads that he had not recently experienced, which led to uncommanded feather extension and the subsequent aerodynamic overload and in-flight breakup of the vehicle.